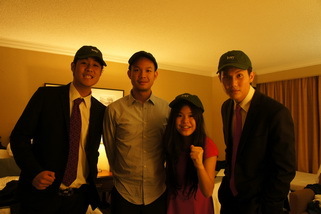 Being the youngest team ever sent abroad to compete at the Scotiabank International Case Competition 2012 in London, Ontario Canada, our goal was to have a good first experience. However, we went beyond the goal by being able to bring home the top three finalists trophy. The Thammasat team comprised of three sophomores and a junior, who are Mr. Weerawit Pipatwongkasem (Opener/closer), Mr. Akkrawin Wetprasit (Analyst), Mr. Attasith Tienwuttinun (Strategist), and myself Phatcharaporn Leelavichitchai (Finance). In keeping with the host of the competition, the Richard Ivey Business School�s philosophy of �Work Hard, Play Hard�, our team participated in a variety of social activities before and after the intense days of case preparation. 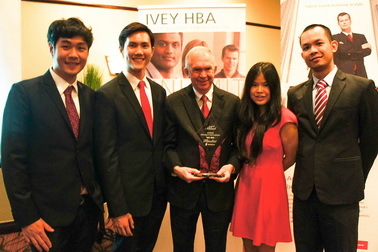 We were awarded second with the �Spirit Cup� as the team that best reflected the Ivey�s motto. All of these would not happened without Ajarn James Fitzpatrick (our advisor), who believed in us and gave us the opportunity to compete for the first time. The entire experience is invaluable to us. Thank you for your sincere coaching, guidance, and support. It was a fun week in Canada. Also Narisa Klieothong (P�pam) for assisting and facilitating us with everything. And last but not least, a big thank you BBA Thammasat Program for supporting this case competition activity. Posted date: April 10, 2012 � 10:15 hrs.